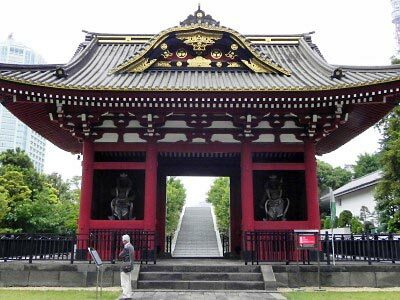 Inuki-mon: the bronze gate was originally for the mausoleom of sixth Shogun Ienobu now the gate to the common graveyard of Shoguns and their family members. Zojoji was one of the two family temples of the Tokugawa Shogun family and six of 15 Tokugawa shoguns were buried there. While the other family temple Kan'eiji in Ueno (cf. article on Yanaka), where also 6 Shoguns were buried, was largely destroyed during the civil war in 1868 and thereafter the most of the temple yard was diverted into parks and cultural facilities, Zojoji could survive the turmoil and by and large maintained its prosperity after the regime change from the Tokugawa Shogunate (1603-1867) to the Meiji imperial government (1868-1912). 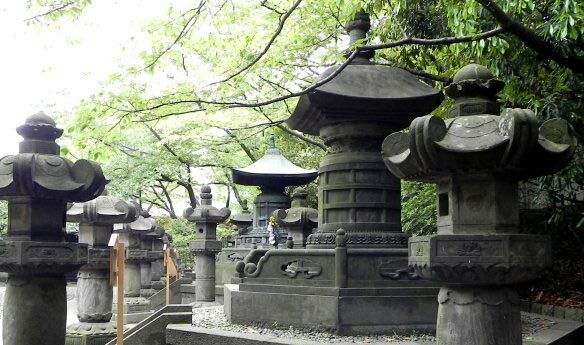 note: The first Shogun Ieyasu (1543-1616) and the third Shogun Iemitsu (1604-1651) were buried in Nikko and the last Shogun Yoshinobu (1837-1913) was buried in the public cemetery in Yanaka. However, the glory of Zojoji was put an end when most of its buildings were destroyed by the air raid at the end of WWII. The graveyards in the north of the temple were burnt down on 10th March and those in the south on 25th May 1945. The graves of Shoguns had been investigated before the start of construction of new buildings. 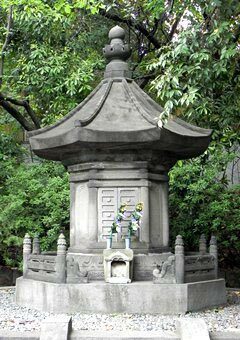 The remains of Shoguns and their relatives were cremated and reburied in 1958 in a much compact way. Now there is a small graveyard with 8 grave towers. Each Shogun was buried under his grave tower, except for the second Shogun Hidetada (1679-1632) who was buried together with his wife Gou (1573-1626). 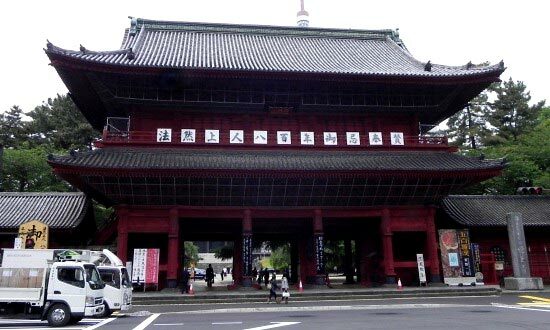 Original Entrance gate for the mausoleums of Hidetada and Gou was saved from fire, but renovated with a bad sense. The second Shogun Hidetada was originally buried underneath a magnificent but wooden grave tower in a large mausoleum. However, his grave tower was burnt down together with mausoleum and he reposes beside his wife under the stone tower which originally belonged to his wife Gou. Gou was the youngest of the famous three sisters from the civil war period in the 16th century. Her mother Ichi (1547-1583) was the younger sister of Oda Nobunaga (1534-1582). Her first husband, father of Gou, commit suicide when he was defeated by his step-brother Nobunaga. Ichi also commit suicide when his second husband was defeated by Toyotomi Hideyoshi (1537-1598). The eldest sister of Gou, Yodo (1569-1615), became a concubine of Toyotomi Hideyoshi and delivered Hideyori (1593-1615), successor of Hideyoshi. After the death of Hideyoshi, Yodo backed up her son and fought three times against the contender Tokugawa Ieyasu, the founder of Tokugawa Shogunate, but finally defeated and commit suicide. Nobunaga, Hideyoshi and Ieyasu are three big names in the civil war period. The life of Gou was closely intertwined with their lives and she battled through a life with ups and downs and ended her life as wife of the second Shogun Hidetada and mother of the third Shogun Iemitsu. This year NHK takes up Gou as heroin of its one year lasting historical drama series and Zojoji took a special decision to open the Shogun’s graveyard to visitors, which is otherwise closed. Few buildings of Zojoji and Shogun’s graveyard were saved from fire caused by air raids, as they were mostly made of wood. The main gate of Zojoji is one of the lucky cases. However, the main building of Zojoji was burnt and rebuilt in 1960 with reinforced concrete and many buildings were rebuilt or newly constructed likewise. In the first decades after WWII, it was usual to use modern building materials such as concrete and steel to reconstruct traditional style buildings. 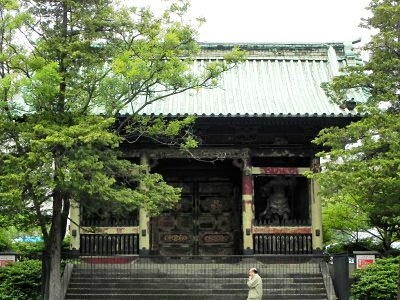 Unfortunately, temples and shrines clearly appear to be fakes when they are built in concrete and steel, though in traditional design. Natural stone constructions, which are usual in many other countries, are more resistant against fire and their maintenance is easier. However, Japan does not have a tradition to build houses with stones, because we have terrible earthquakes. Wooden buildings can be used for centuries, if they are properly maintained and lucky enough not to be exposed to fire. But, very few buildings have such luck. 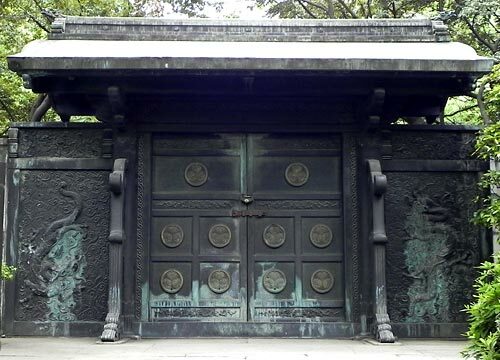 Among the buildings of earlier mausoleums, we can still see the entrance gate for the southern mausoleum, which was dedicated only to Hidetada and his wife Gou. From the northern area, where five Shoguns were buried, the entrance gate for the mausoleum of the seventh Shogun Ietsugu (1709-1916) still exists, but it is unfortunately only badly maintained. The stone tower of Iemochi and the bronze tower of hit wife Kazunomiya behind it. Nitenmon was the entrance gate for the mausoleum of child Shogun Ietsugu. Another famous wife is Kazunomiya (1866-1877). Shie was the younger sister of Emperor Komei (1831-1867), the father of Emperor Meiji. She was sent by her brother to the 14th Shogun Iemochi (1846-1866) in Edo as a symbol of appeasement between Shogun and Emperor. Though her mission failed, they were said to be the best couple among 15 Shoguns and their wives. The main gate of Zojoji was built in 1622. To tell the truth several other buildings and stone and bronze objects survived the war, but they were taken away, brought to a temple Sayama Fudoson in Saitama prefecture near and rebuilt there. The then owner of Seibu Group including Prince Hotels gathered valuable buildings from the places where Prince Hotels were built and collected them together in the newly built temple near the baseball stadium Seibu Dome, the home ground of Seibu Lions. Sayama Fudoson opened in 1975 and nowadays Seibu Lions goes to the temple to pray for the victorious season. I have not seen those reconstructed buildings in Sayama Fudoson. However, I believe that old buildings should be kept in the original places with as much as original surroundings. However, rich entrepreneurs are the tycoons of today and they can change the past.